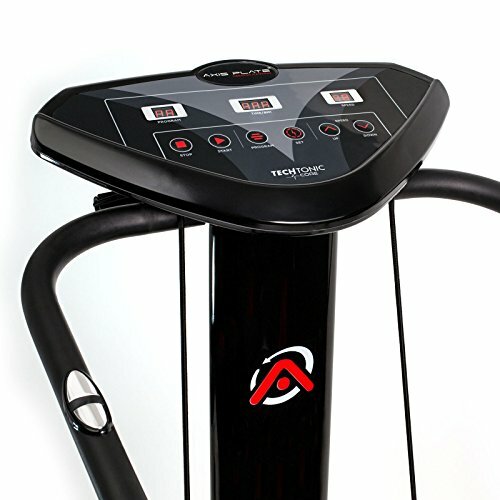 The Axis-Plate F-1200 vibrating exercise machine allows you to enjoy a professional-grade vibration plate experience in the comfort and privacy of your own home. Start experiencing the health benefits of this exercise modality anytime, anywhere. Providing the ultimate in vibration training, this quality, time-tested and built-to-last design packs a substantial 500 watts of power, yet conveniently runs on a US-standard 120 volt grounded power cord (included). Regardless of your current fitness level, this machine makes it easy for anyone to begin regular practice of vibration therapy, or increase intensity. Customize workouts to fit your needs, with an easy-to-read control panel featuring 99 speed settings, along with 3 pre-programmed workouts, and an optional manual mode. This vibration machine allows for easy monitoring of your progress with integrated BMI (Body Mass Index) sensors built into the handles. Unit also features removable upper body resistance bands to allow the entire body to be highly engaged during a workout, for effective and lasting results. Sleek design tucks conveniently into a corner or any small space, with overall dimensions measuring 27-1/2" long x 29" wide x 48" high. Weighs 62 pounds. Maximum weight capacity: 265 pounds. Includes front mounted wheels for easy transport and non-skid rubber feet for full stability. Includes full assembly instruction manual plus exercise guide. Axis-Plate is your trusted source for professional-grade fitness equipment that provides lasting quality and exceptional value. If you have any questions about this product by Axis-Plate, contact us by completing and submitting the form below. If you are looking for a specif part number, please include it with your message.